2015 Domaine Caroline Morey, Santenay Rouge “Le Chainey” Cote de Beaune, France. The historic Morey family has many famous names and domaines, almost too many to list, but Caroline Morey is one to search out, she’s the daughter of Jean-Marc Morey who retired in 2014 and gifted her a few prized vineyards and parcels to start her own label. 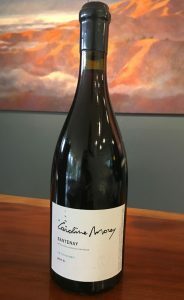 It must also be noted Caroline is married to Pierre-Yves Colin-Morey, one of Burgundy’s hottest winemakers and she shares many methods and with a shared approach to winemaking. So it’s going to be interesting to see where her wines get to quality wise, but if they follow what I found in the bottle here with her Santenay Le Chainey Rouge, then she is certainly going to be a star in her own right. The 2015 is slightly reductive at first, but is utterly charming, lighter in form than expected from the vintage, gaining personality and grace every minute with air showing rose petal delicacy, a hint of smoke and layers of tangy red cherry, strawberry and tart red currant fruits along with a mix of tea spices, bramble and blood orange note all wrapped up in a lovely medium weight body and smooth palate with silken textures and mild acidity. Her heirloom vineyards, throughout Chassagne and Santenay, give her an advantage of great fruit sources, usually especially challenging for a start up domaine in Burgundy, so she has hit the ground running and has some wonderful premier releases out that show considerable quality, precision and terroir focus. In the cellar Caroline echos her husband’s ethos with indigenous yeasts ferments and barrel aging in bigger barrels with the use of 350L casks, also in not stirring the lees to keep things more intensely vibrant, while still delivering textural richness, in particular in her white, but the reds are lovely too, as this one shows. Caroline Morey is an all Cote de Beaune winery as she vinifies about 60% white wine and 40% red wine all from appellations in Santenay, Chassagne-Montrachet and Beaune, with her winemaking operations, along with Pierre Yves, who I assume is helping in crafting these wines, all done at a new purpose-built facility just on the outskirts of Chassagne. Coming from vines located in the southern sector of Santenay quite high on the slope adjoining 1er Cru Grand Clos Rousseau, the Santenay Le Chainey is 100% de-stemmed and the wine is aged in mostly used French oak with about 30% new barrels in 2015, which is pretty classic stuff, making for a pretty Pinot Noir with a lighter profile, but with ripe vintage character, it’s a wine that grows on you, no question.